A great misnomer of our time: public transport. Public transport is something we all take for granted in a modern, urban, civil society. Like "democracy" itself, however, "public transport" is just a hollow abstraction to which our civic leaders occasionally defer, as it suits the mood of the electorate, by paying enthusiastic lip-service. Except for one or two inner-city novelty tourist tram loops, there is NO public transport in the city; much less the outer suburbs. As is typical of the capitalist modus operandi, the public transport system is a vast, sprawling mechanism for maximizing private profits. – ensures that the underclass is automatically denied legitimate (notably, legal) access to ridership within the “public” transit network. Financial penalty or worse – sometimes, much worse – awaits the underclass traveller who (minus credit card, Internet access, wallet even – what on earth for?) happens to be apprehended by an armed thug in the pay of wealthy shareholders, clamouring insistently for ever more profitable returns. Tenants, in turn, are asked to pay more for rental properties having the merest semblance of reasonable access to public transport. As is their lot under capitalism, the poor are further removed, exiled to suburbs serviced only by more costly (financial, environmental), complicated and time-consuming modes of transit. 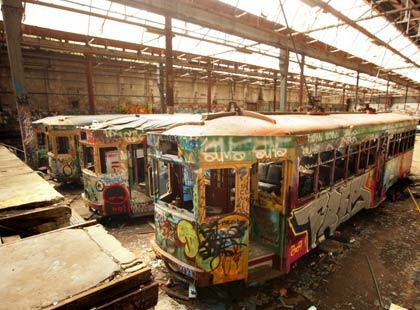 Property values around Westgarth and Northcote must have soared given the recent improvements to tramway infrastructure. Lucky for some. Did Yarra Trams invent the wheel? Neither should a vulnerable sector of the Australian community – a swelling, writhing underclass comprising those in direst need – be denied access to a "public" benefit. I speak only for myself. Your mileage may vary.